And, finally, after a year of weekly posts, we come to the last episode in "The Grantland Rice Story". Program GRS-52 is titled "Memorable Tributes to Granny Rice" and includes recordings by John Kieran, Robert T. Jones and Gene Fowler with their memories of the famous sportswriter. 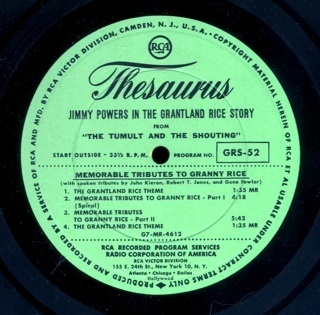 The program was transferred from an original RCA Thesaurus 12" transcription, matrix number G7-MR-4612-1. Since there's only two episodes of "The Grantland Rice Story", let's finish out the program with a double post of the last two shows this week. 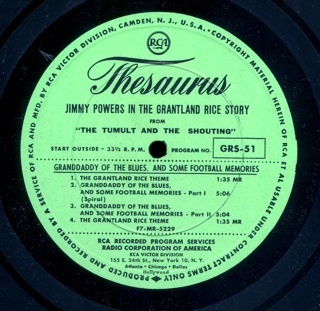 Program GRS-51 is "Grandaddy of the Blues and Some Football Memories", transferred from an original RCA Thesaurus 12" transcription, matrix number F7-MR-5229-1. 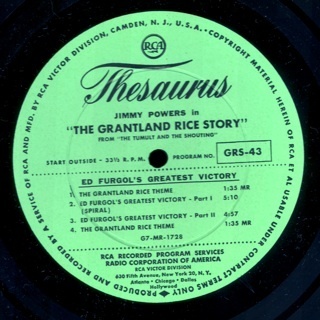 Program GRS-50 in "The Grantland Rice Story" is "The Uncrowned Champs", where Jimmy Powers narrates excerpts from Rice's memoirs on athletes who played in the shadows of others and are taken for granted. The show was transferred from original RCA Thesaurus 12" transcription, matrix number F7-MR-5228-1. Just two more episodes of the series left to go in the blog. 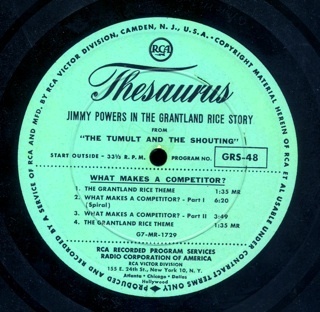 NBC television sportscaster Jimmy Powers steps up again this week to narrate "The Grantland Rice Story", based on the memoirs of the famous sportswriter in this mid-50s syndicated series from Thesaurus. Program GRS-49 has Rice discussing "Famous Football Coaches". It was transferred from an original RCA Thesaurus 12" vinyl transcription, matrix number G7-MR-1762-1. Our mid-fifties syndicated sports series, "The Grantland Rice Story", based on the memoirs of the famous sportswriter is quickly coming to a close. Program GRS-48 has Jimmy Powers narrating Rice's thoughts on "What Makes a Competitor?" As usual, the show was transferred from an original 12" vinyl RCA Thesaurus transcription, matrix number G7-MR-1729-1A. 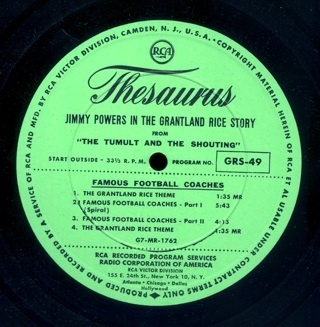 Program GRS-47 in our series, "The Grantland Rice Story", is "The Big Game". NBC sports announcer Jimmy Powers narrates Rice's thoughts on football rivalries that result in a "big game" each year and play an important part of the sport for players and fans. As usual, the show is transferred from an original RCA Thesaurus 12" transcription, matrix number F7-MR-5233-1B. Program GRS-46 of "The Grantland Rice Story", narrated by NBC sports announcer Jimmy Powers, takes up the subject of "Ruth's Homer". The guest on the program this week is Ford Frick. The show was transferred from an original RCA Thesaurus 12" transcription, matrix number F7-MR-5087-1. 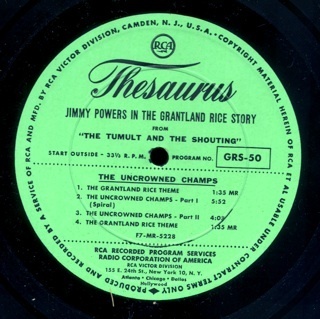 The show was transferred from original RCA Thesaurus 12" transcription, matrix number G7-MR-1731-1. This week's entries are going up a bit early - things are getting busy with the start of the new school year. Our run of Jimmy Powers narrating the mid-fifties syndicated series, "The Grantland Rice Story" continues. There are 52 episodes in the whole series, so we have just a few weeks of programs left. Program GRS-44 in the series is "Irwin S. Cobb-A Man of Heart", where Rice reflects on his old friend who was a reporter and author famous for his stories about colorful Kentucky characters. Cobb's work was the basis for the Will Rogers film, "Judge Priest". Our show was digitized from an original RCA Thesaurus 12" transcription, matrix number G7-MR-1730-1B. 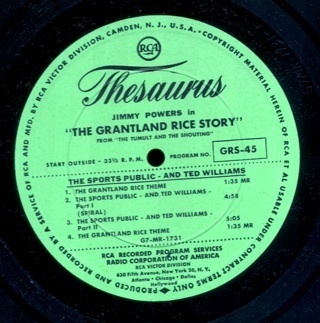 Jimmy Powers takes up "The Grantland Rice Story" once again this week, continuing our look at this mid-fifties syndicated series from Thesaurus based on the memoirs of the famous sportswriter. Program GRS-43 looks at "Ed Furgol's Greatest Victory", the 1954 US Open golf championship. As usual, our show was dubbed to digital directly from the original RCA Thesaurus 12" transcription, matrix number G7-MR-1728-1B.